Fig. 41 Fishbone chart. Simplified fishbone chart for draught beer. (Note: Fishbone charts are usually drawn horizontally). a chart that breaks down the PRODUCTION of a product into its constituent operations as a means of identifying the source of a product defect. Fig. 41 shows a simplified fishbone chart for draught beer. 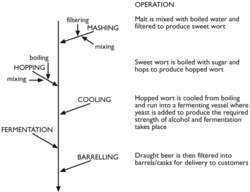 Should a poor QUALITY batch of beer be produced this could be due to a malfunction in any one or more of the operations listed, including faulty or unclean equipment (mash mixers and filters, fermentation vessels), incorrect material mixes or poor strains of malt, hop or yeast, or incorrect boiling and cooling temperatures and periods. Fishbone charts can also be used more proactively to detect and prevent quality problems on a continuous basis as part of a commitment to TOTAL QUALITY MANAGEMENT. See QUALITY CONTROL, FIVE M.
Most companies use some form of flow chart, fishbone chart, or check list at this point to help identify possible causes. One technique for analyzing problems that is popular in statistical process control is the fishbone chart or Ishikawa diagram. For example, a presenter, despite obvious pride in the achievement, shouldn't announce to a team: "Here is a fishbone chart displaying the root cause of all the problems with the admission process, which took a long time to do. The category of main concern (worst case) in the histogram may become the spine of a fishbone chart. Two charts I find most useful are: the Fishbone Chart, and the Frequency Matrix. These range from bullet types--individual pieces, such as Ishakawa fishbone charts, numerous models of ranking risks such as FMEA, and design of experiment (DoE) software--to combinations of the pieces. Fishbone charts, or cause-and-effect diagrams, explore the root causes of a problem in diagrammatic form. Often called fishbone charts because they resemble the skeleton of a fish, they are designed to identify all of those factors that can have an effect on the process under analysis. Some team members have also received training in technical skills such as calculus blueprint reading, problem-solving, and creating simple data documents such as fishbone charts, Pareto charts, and histograms. They should begin using quality improvement tools: flowcharts, fishbone charts, and Pareto diagrams. How straight is the road to QI? With Drag 'n Draw, any user can create an unlimited number of diagrams, such as electrical schematics, fishbone charts, flowcharts, landscapes, network diagrams, organizational charts, timelines, quality control diagrams, space planning, technical drawings, and more. Fishbone charts, or cause-and-effect diagrams, explore in diagrammatic form the root causes of a problem.